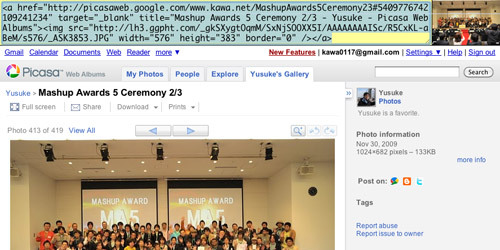 Kawanet Tech Blog: img2html - bookmarklet for blog posting with flickr, picasa, etc. 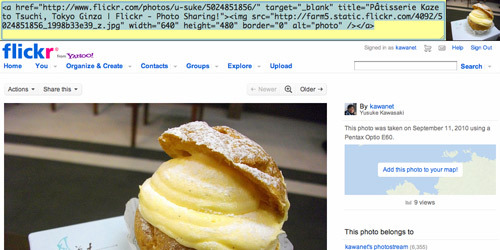 img2html - bookmarklet for blog posting with flickr, picasa, etc. The img2html bookmarklet below helps you to get a html source code with a <img> element which refers photo sharing service, ex. Yahoo's Flickr, Google's Picasa Web Album, etc. You can also try just to click the link above for testing on the site. The largest image on page is picked up by the bookmarklet. Also works on Picasa Web Album and any other websites.